The original Tropico (2001) took the self-serious city builder/economic sim game and added a big helping of satiric spice to the formula. Eighteen years later, that is still exactly the premise behind the franchise, and although subsequent iterations have added to, subtracted from and re-introduced elements, there is little doubt that players of the original would feel right at home in Tropico 6. The premise: you are the dictator of a small Caribbean nation in the middle of the 20th century and your goal is to control the reigns of economic and political power and grow your little banana republic through any means necessary, be it piracy or the exploitation of your workers. As many despots are prone to do, you control the workforce with an iron fist while supplanting their meager lives with various vices and entertainments. You lure tourists to the island with luxurious resorts and the trappings of wealth and you make backroom deals with various other leaders. You threaten, cajole and boast as you stand on the balcony and listen to the pre-recorded cheers of a grateful nation. You move from baby dictator on the fringes of the Cold War to selfie-snapping, social media savvy tyrant. There have always been two ways to play Tropico: there is a loosely structured, non-linear campaign, and a sandbox mode that can have as many or as few challenging restrictions as the player wants. The 15-mission campaign is really a series of flashbacks and each has a sometimes tricky set of objectives to fulfill but it’s definitely where Tropico 6’s very broad sense of humor and political and cultural satire are most evident. Because each citizen has his or her own autonomous needs and wants, part of the fun of Tropico 6 comes in trying to satisfy the sometimes capricious nature of the population, whether individually or in the various labor unions, political factions or religious groups. Then there are the various superpowers that must be placated, and from whom landmarks can be pilfered. With an unlimited cash supply and nothing to do but build and build, the sandbox mode can start to feel a little aimless in comparison. Under the hood, Tropico 6 is a rather robust simulation with many moving parts but over time, the game’s interface has been evolving and becoming very user-friendly and easy to understand. There is a ton of information but it never clutters or overwhelms the central, pleasant task of building a thriving city. Actually, now that various islands can be connected by bridges, it’s fun to create full archipelagos chock full of people and industry. As welcoming as the UI and overall vibe of Tropico 6 might be, it is still occasionally opaque about some systems and players will need to use a combination of trial and error and creativity to make it through the campaign alive as El Presidente. 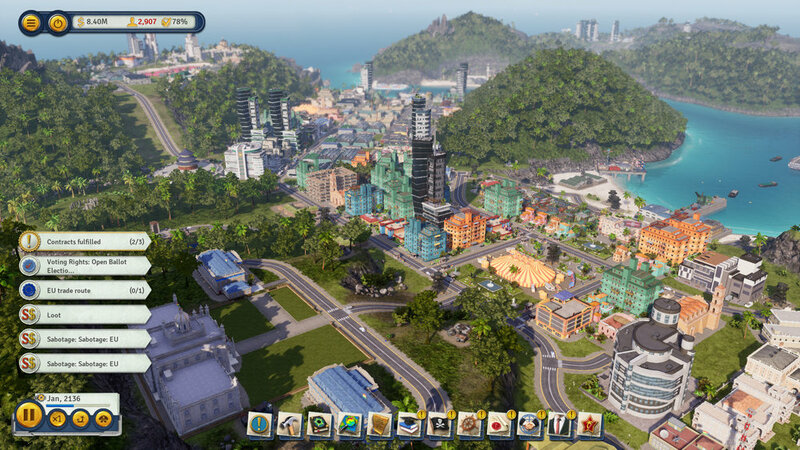 The Tropico franchise has always featured colorful visuals and island-flavored music and at this stage in the series — and with the graphics at their highest settings — Tropico 6 looks great… at least from the mid-distance. Up close, textures are a little lacking in detail and sharpness and the limited number of character models for the populace becomes more apparent. The music, too, can become a bit overly familiar, though in small doses it’s bouncy and flavorful. Maybe due to its irreverent tone, Tropico has never been taken entirely seriously as a legit economic sim and city builder. That’s a shame, because puttering around the islands has always been both fun and satisfying. Tropico 6 pulls some mechanics from prior entries and introduces some new ones while giving fans of the franchise the best-looking, most feature-packed and entertaining installment to date. Some up-close texture issues, occasional framerate hiccups, and a lackluster cadre of voice actors aside, Battlestar Galactica: Deadlock is one of the best -- and certainly, most respectful -- of the Galactica -inspired games. Although no game has really captured the deep philosophical underpinnings and complex human drama that made the series so engaging Deadlock nails the exciting and tactical battles that were such a memorable aspect of the show. With over 30 tracks, hundreds of impressively rendered cars, and a robust and option-rich single player campaign (not to mention endless single, one-off races), Forza 7 has to represent the current apex of the racing sim. While it isn't a decisive leap forward from Forza 6, neither is it a step back. The cars just get better looking, the handling more precise, and the overall experience more comprehensive and immersive. I can't wait to try it on the Xbox One X. With over a decade between installments, it's not like the SpellForce franchise has overstayed its welcome. It's perfectly timed to delight both fans of the series and surprise new players looking for something new and different. If you’re expecting The Bard’s Tale IV to be an action-RPG on par with some recent blockbusters, you may be disappointed. This is not a cinematic experience with bleeding edge graphics and breathless action and combat. However, if you approach the game as a super-enhanced, classic dungeon crawler that both fits into the legacy and moves the needle on a well-respected, beloved franchise, then you will be pleased by it. Planet Coaster represents a return to form and sets the bar very high for sim designers in general. Fun, flexible, deep, endlessly entertaining -- and at a bargain price -- Planet Coaster might not be for every gamer, but for fans of the genre it can't be beat.